Featuring traditional recipes and dazzling on-location photography, Sharing Puglia transports you to the sun-kissed Puglia region of the southern coast of Italy. 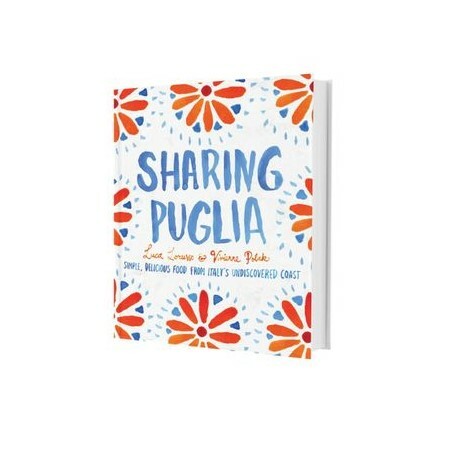 A collection of the quintessential culinary delights of Puglia, the recipes in this fresh and modern cookbook focus on delectable dishes perfect for sharing with friends and family. Celebrate seasonal produce with dinner party menus for entertaining, or prepare a few simple antipasto dishes such as pickled artichokes, bruschetta with olives, and taralli (savoury crackers). Luca Lorusso and Vivienne Polak introduce readers to the delicious regional cuisine of one of Italy's most spectacular regions - try their eggplant parmigiana, artichokes with fried potatoes, and smoked scamorza cheese salad with mushrooms, along with their best artisanal pizzas and the region's stand-out pasta dishes. With a vibrant, modern design throughout, Sharing Puglia ensures lovers of Italian cooking will not be disappointed. Luca Lorusso was born in Corato in Puglia, where his family lived on the edge of town in a house which backed onto fields abundant with olive trees, tomato plants and fruit trees. Luca's love of cooking comes from his 'mamma', who cooked meals for his large family using local and seasonal produce and who encouraged him to see cooking and food as a means to bring together family and friends. Luca now lives in Melbourne, Australia, where he runs a restaurant serving food inspired by Puglia. Running a restaurant is very different from cooking for family and friends, but the essence is the same: use quality ingredients, simple and effective cooking methods, and lots of love and passion.